How do I verify my site for Flippa.com? If you are a Yola Silver member, you will have access to the head section of your site to add the meta tags. Click on Site > Site Settings. 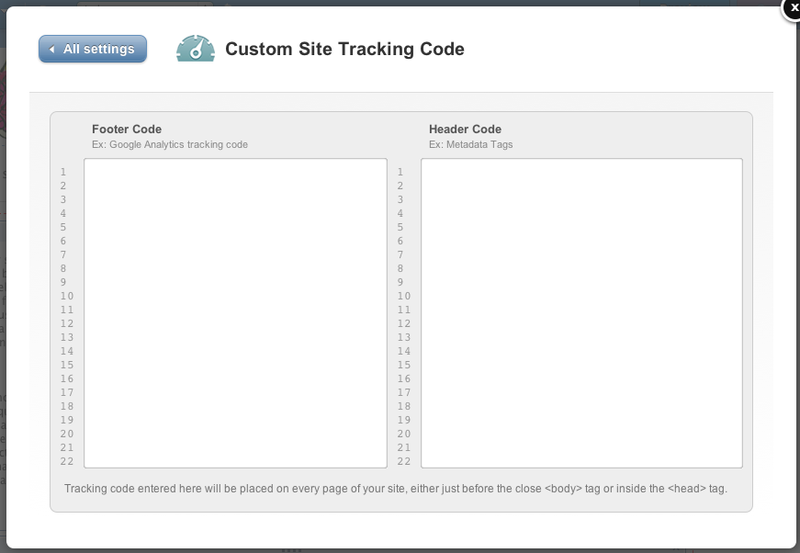 In the Tracking panel, click on "Site Tracking Code". This will open up the Site Tracking Code window and you will be able to add the meta tags in the Header section (see below). Thanks for your reply. I tried what you said and it didn't work. I pasted the code provided by flippa into the exact spot you said and Flippa was still unable to retrieve it. Flippa says these exact words "Copy the meta tag below, and paste it into your site's home page. It should go in the head section, before the first body section." Is the place you told me to paste the code at exactly what Flippa is asking for? The comment block will not allow me to use the < keys, but there are < keys around the "head" and "body" in the above comment. We're sorry that this did not work for you. Unfortunately, I am not aware of any other tips that might help with this. I'm sorry. I have sent Flippa a message asking if they can manually check for the meta tag. This should be seriously discussed with Yola as Flipping websites is a big business. Using Yola to build sites is easy and very fast, so others may also start to do this. Please continue to work on this with me. I have a silver membership, but if this doesnt work, I will have to go back to wordpress. I love Yola, but wordpress has no problems whatsoever and may better suit me for the kind of work I do. I just sold 2 websites last week that were wordpress, and I cannot even verify site ownership with Yola. This is very frustrating. Can I host my Yola site on my own server? We understand how frustrating this is and are hopeful that Flippa will be able to manually locate the meta tag. Please let us know if that is not the case. We do not offer the opportunity to download a website from Yola, so hosting on your own server is not available. I sent Flippa a message telling them that I used Yola Site Builder and that I was unable to place the verification script in the exact spot they needed, and they manually checked the tag and verified it for me with no problems. So if anyone has Yols site for sale, you will have to get Flippa to verify the script they provide you with manually. Thanks for the update, Daniel. We are happy that Flippa was able to locate the tag and verify your site. Please let us know if you need any further assistance, we'll be happy to help!